This article was written by Noel Kaho and published in the Ranchman magazine in 1941. Will Rogers’ ancestors didn’t come over on the Mayflower. Will said so himself. And it is a pity that he did not go on, in that delightful manner of his, to give an account of his family’s history, for that history is as exciting and romantic a tale as any that’s played itself out in real life against the backdrop of American history. Will, of course, remembered much of his father, for Will was past thirty when Clem died. But Clem remembered nothing of his father for he was in his first year when Robert died. Clem was born in the Going Snake District of the youthful Cherokee Nation (January 11, 1839.) And in that year, had he been able to remember and catch the meaning of his father’s words, he would have known of the strife and turmoil that disturbed that western Cherokee Nation. Well, Clem did. Magnificently. Especially in the way he met the obstacles that constantly rose before him; an unliked step-father, a hatred of school, a pioneer home abandoned, a war of far greater dimensions than his father Robert had ever envisioned might come upon the Cherokee people; Clem’s wife fleeing the Nation as a war refugee, but before that losing a baby child before the war had struck its full and devastating force. And during the straining refugee days another child born, she who, last of the Clem Rogers’ family, lives today in Chelsea…Mrs. Sallie McSpadden. After the war there was poverty as only those who have known complete loss can value; a poverty that put Clem to driving wagons of freight over dim, and often indistinguishable roads from Fort Gibson to Sedalia and Kansas City. A poverty that only those with ambition and a driving desire to be independent can place upon themselves and their families while they save toward that day of striking out, of pioneering, again. When Clem Rogers pioneered into the Verdigris Valley a second time he took the right turn of the road near Claremore Mound and went up the river to the place now famous over the whole world. The first patch of ground, up the left turn on the Caney River, is lost, like those old roads that once crossed the Nation, in the oblivion and the erosion of time. He came with cattle that he and Major Lipe had bought…Clem had been driving the freight wagons for Major’s father, Oliver Wack Lipe. And he built a house and brought his family out the following November. There was Sallie, Bob, who had been born in the Choctaw country as Clem and Mary were slowly returning to the Nation after the war, and Maude, born at Fort Gibson, where Mary lived on a sister’s farm. The family arrived the evening of Maude’s first birthday and that night she took her first full steps. In face of a brand of politics that was the envy of many another politician in the Cherokee Nation, a kind that brought down upon itself and its purveyor, charges of bribery and senatorial investigations, he still came out triumphant. For Clem was the darling of the Oklahoma Constitutional Convention and had a county named for him by unanimous vote of the delegates: Rogers County, Oklahoma. 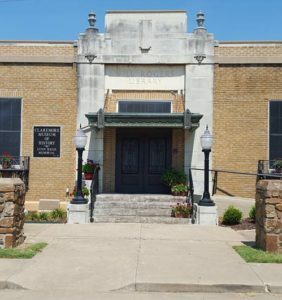 After Clem’s beloved Mary died, and even after his second wife, Mary, had died, Clem sat in the board room of the old bank in Claremore and watched toward the sunset, toward a hill about a mile from town that someday would be the resting spot of his son’s body and where a great memorial was to be built. The sunset of his own life was approaching and he knew it. And one week-end he went up to Chelsea to pay his usual visit to his daughters, but he did not come back to Claremore any more. Most people who help make history are seldom aware of the fact. And that was true about Clem. He was too busy. History? Why, that was something Robert had helped make, or the Robert before that back in the Eastern Cherokee Nation. History was something of the past; not something of today. Besides, Clem was busy riding his own horse…magnificently!